Bombardier Recreational Products (hereafter known as BRP) tries to remain humble. But, what are you going to do when you’re this good? BRP made big news with the Can-Am Spyder. It brought the rush of the open air to the portion of the public that is afraid of traditional motorcycles. The Ryker might be even bigger news. It is (we feel like we should offer the caveat of “arguably” but there really is no valid argument) the most accessible 3-wheeler ever built. We mean that in terms of both driving and pricing. 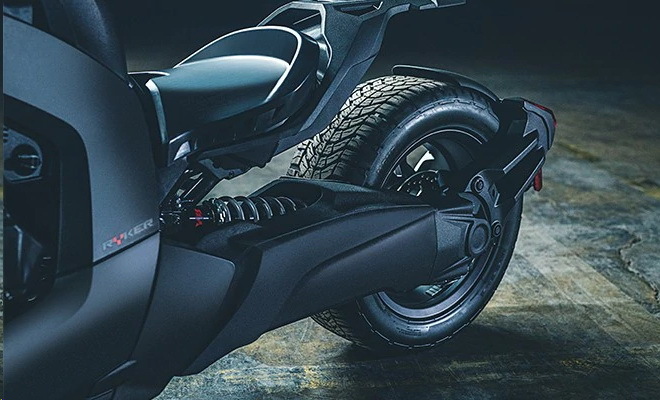 Stylishly built and with features and mechanicals one would expect on a bike twice as expensive, the Ryker is destined to be a disruptive force in the three-wheeled world of bikes. At this price, and at this fun quotient, the Ryker could be disruptive in the whole world of bikes. Was Gildshire about to pass up a chance to learn more about this? Not a chance! GlobeNewswire helped with the research. The Ryker is BRP’s new model in its fast-selling Can-Am On-Road 3-wheel lineup. Its brothers are the Can-Am Spyder models. What makes the Ryker a unique member of the clan? It is meant to bring the 3-wheel experience to everyone by busting the accessibility barrier. We’re talking about easy riding (not to be confused with “Easy Rider”) and a low, low, purchase price. How easy is the ride? This bike has an automatic transmission and is a twist and go go go! “Our research has shown that thousands of more people around the world would be willing to consider riding on three wheels if it were more affordable,” said Josée Perreault, Senior Vice-President, Can-Am On-Road at BRP. Available with either a 600cc Rotax twin or a 900cc Rotax triple, the Ryker can come out of the chute as either a bare-bones model or as a model with an extra hop in its step. There are also an amazing array of Ryker accessories, giving its new owners more than 75,000 ways to customize it. If that’s not enough, there’s a Rally model for those who like to focus on off-road fun. All of this for just $13,949 customized the way Gildshire would customize a bike for the best in performance and visibility on a cold winter night. Does BRP have a winner? We say they do!